Much has been reported on the creation of Opportunity Zones and even more on their tax advantages, but, less has been written about the specific Opportunity Zones that are now found in all 50 states and US territories. Although there are more than 8,700 designated census tracts in the Opportunity Zone program, some offer more potential for immediate positive impact for both investors and residents than others. Here we take a look at Opportunity Zone areas in major metropolitan markets with the most promising near-term growth potential. Opportunity Zones were designed to encourage private investment generally in economically distressed, low-income census tracts through capital gains tax incentives. Under the Opportunity Zone program, up to 25% of census tracts that met income requirements of the Opportunity Zone program were eligible to be nominated as Opportunity Zones. Additionally, up to 5% of census tracts that didn’t meet income requirements of the Opportunity Zone program, but satisfied other qualifications, were also eligible to be nominated as Opportunity Zones. 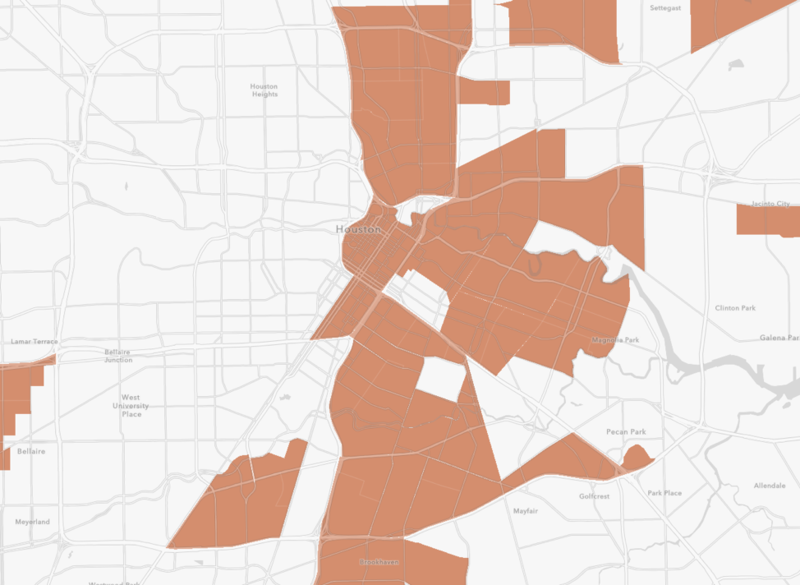 The end result: 57% of all neighborhoods in America were up for consideration as Opportunity Zones, and more than 8,700 census tracts are now designated as Opportunity Zones according to the Brookings Institute. The expansive reach of the Opportunity Zone program throughout the country now offers many new tax-advantaged options for investors and entrepreneurs to explore diverse Opportunity Zone investment options intended to benefit these distressed communities. With many Opportunity Zones based in or adjacent to growing neighborhoods, in our view, here are the top 10 Opportunity Zones in the country with more immediate growth potential. Many California Opportunity Zones offer immense opportunities for residential and commercial real estate. While very little of San Francisco falls into qualified Opportunity Zones, there are several East Bay and Oakland Opportunity Zones. Oakland and the East Bay have experienced rapid growth and neighborhood improvements over recent years. The city’s population has been increasing since 2011, and job growth has outpaced housing development in the Bay Area. On the residential development side, due to high (and still climbing) housing costs in San Francisco, housing in Oakland is in demand and home prices are on the rise. A 24-story, 402-unit apartment tower is set to open near the MacArthur Bart Station in 2020. West Oakland, Uptown, Jingletown, and Coliseum Industrial are all experiencing active residential development as the West Oakland, 19th Street, Fruitvale, and Coliseum BART stations, which have all become convenient hubs for job and residential growth. Many parts of Los Angeles now fall into Opportunity Zones. Downtown Los Angeles and the LA Arts District, plus the surrounding areas directly south and east make up the largest contiguous section of Opportunity Zones in the city. Between May 2013 and May 2018, Downtown Los Angeles home prices kept pace with Los Angeles levels overall with a nearly 32% increase in prices. Downtown Los Angeles is undergoing a revival and attracting new residents and businesses. Several new apartment buildings with 150+ units and hotels were set to open in 2018 alone. A 125,000 square-foot shopping center and office complex, At Mateo, opened in 2018 in the Arts District of Downtown Los Angeles, and Spotify and Soylent are planning on opening offices in the new building. Los Angeles Opportunity Zones aren’t limited to Downtown. West of Downtown Los Angeles, multiple emerging neighborhoods along the 10 Freeway have received Opportunity Zone designation as well. These areas are attractive not only because they have easy access to the 10 Freeway, but also with the extension of the Expo line from Downtown Los Angeles to Santa Monica, they are more connected to the city and convenient than ever. With the addition and extension of more Metro lines across the city, these areas will become increasingly accessible and in demand. Further south, housing is more affordable than in many other parts of the city, and these areas also have access to several freeways. Now that many areas of South Los Angeles fall into Opportunity Zones, entrepreneurs and builders have even greater incentives to develop more housing and local amenities in these emerging neighborhoods. Fundrise has invested or committed approximately $100 million in neighborhoods in and along the areas now designated as Opportunity Zones in Los Angeles. We have long been believers in investing in high-growth-potential neighborhoods that now define many Opportunity Zone throughout the nation. Building in San Jose, and the Bay Area in general, is challenging due to zoning, land costs, and land entitlement procedures. However, with the introduction of Opportunity Zones, there are new opportunities available to builders and entrepreneurs. The city is experiencing rapid housing and business growth as regions of the Bay Area further north near Mountain View, Palo Alto and San Francisco become increasingly expensive. Many key parts of San Jose, including portions of downtown San Jose now fall into designated Opportunity Zones. Downtown San Jose is home to the Civic Center, San Jose State University, Adobe, the regional multi-modal transit center, and will soon be home to a new Google campus which is expected to add one million square feet of office space. From these communities alone, real estate investors can expect demand for walkable businesses and housing options to support students and employees. Other neighborhoods which fall in or near San Jose Opportunity Zones offer opportunities to take advantage of transit options as well as urban infill. Last but not least for California Opportunity Zones, is the most southern city: San Diego. Like other cities in California, San Diego is growing rapidly and experiencing an affordability crisis. Many central parts of the city, including neighborhoods less than 10 miles to both the Pacific Ocean and the San Diego International airport are now included in Opportunity Zones. While adding new development to San Diego has proved to be difficult for developers, the introduction of Opportunity Zones offers investors new incentives to combat the affordability crisis in neighborhoods previously bypassed. Areas already in demand, such as South Park and Golden Hill, now sit between Opportunity Zones, the Bay and bustling Balboa Park. Many parts of Barrio Logan also now fall into Opportunity Zones, which offers its central location even greater advantages. Like other cities on this list, Seattle is facing an affordability crisis due to underdevelopment relative to the city’s growth in population. Amazon alone plans to expand from 8 million to 12 million square feet of office space in the city, which will surely attract new residents and drive greater demand for housing and businesses. The International District is home to many large scale commercial developments, and with the introduction of new tax incentives under the Opportunity Zone program, there are greater incentives for builders and entrepreneurs to seek out more options for new office space in Opportunity Zones. Beacon Hill, which is experiencing rising home prices also offers potential for adding or renovating housing for existing and incoming residents. Denser housing options are slowly getting added to the city, such as the six new condo buildings set to open in the city by 2020. But more is likely coming to accommodate the city’s growth. 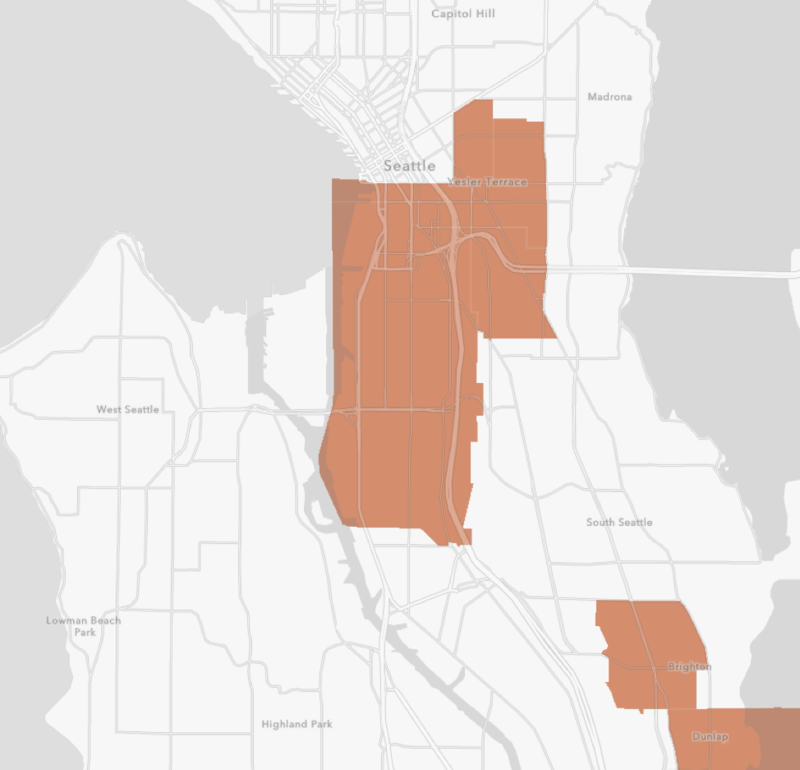 The addition of large contiguous sections of Opportunity Zones throughout south Seattle offers real estate investors a new tool for building denser, transit-oriented housing. Large portions of Downtown Portland now fall into Opportunity Zones, including areas, which have experienced rapid growth in recent years, such as the Pearl District and Central Eastside. Located up against the Willamette River and less than 10 miles from Nike’s worldwide headquarters, new businesses are opening in the Pearl District and there has been significant investment in new commercial space. Long expanses of riverfront property overlooking both sides of the Willamette River have also been included among Portland Opportunity Zones. 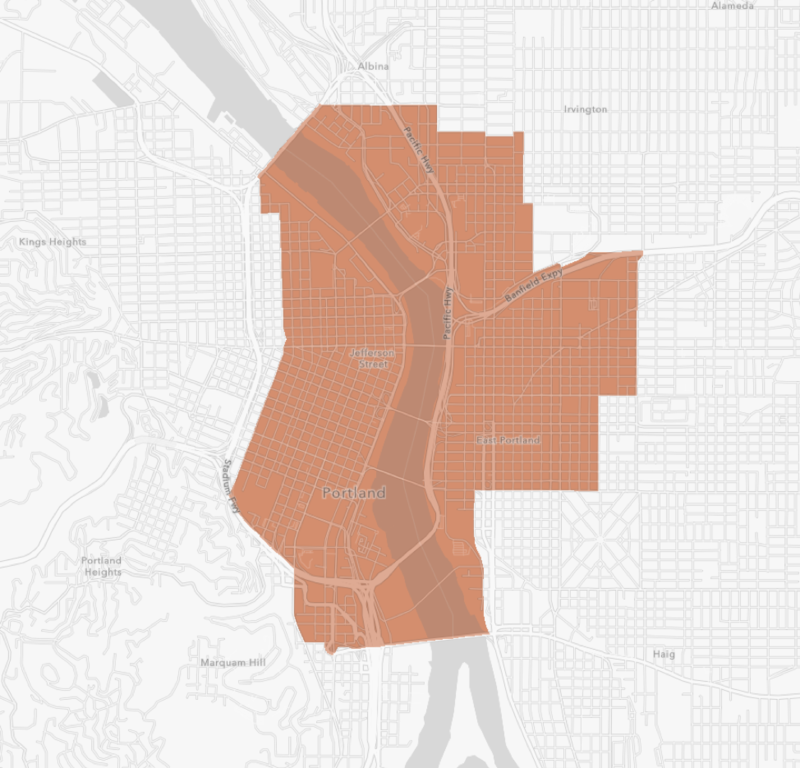 Portland’s Central Eastside neighborhood has also experienced rapid growth in recent years. Located directly across the Willamette River from Downtown Portland, this historically industrial neighborhood has become one of the most sought after locations in the city. In 1986, the Portland Development Commission established the 692.3 acre Central Eastside Urban Renewal Area (CED). The CED created a series of financial and regulatory incentives to encourage investment in the Central Eastside neighborhood. The unique combination of CED incentives, historic industrial buildings, affordability, and central location have already attracted more than 1,100 businesses and 17,000 jobs to the Central Eastside neighborhood. Portland continues to attract talent away from Seattle and San Francisco due its relative affordability. The city has experienced roughly a 10% growth in population over the past 7 years. Affordability issues though have already hit Portland and are also beginning to hit other parts of Oregon. Phoenix is among the fastest-growing cities in the country. In 2017, it added roughly 66 people per day to its city. Phoenix is a growing job and an expanding college center. Many of its neighborhoods experiencing or poised to experience high growth are now in or near Opportunity Zones. Downtown Phoenix is home to new college campuses of Arizona State University and the University of Arizona. Arizona State University’s Downtown Phoenix campus now has more than 10,000 students enrolled and both schools expect higher future enrollment numbers. The surrounding areas will likely receive demand for greater businesses and housing options within walking distance of the campuses. A new light rail extension running down Central Avenue is also set to connect Downtown Phoenix to northern neighborhoods, which will offer a convenient option for commuters. Phoenix Opportunity Zones are likely to benefit from growth in industries in and near the city. Major job centers, such as Mesa, Chandler, and Tempe also have Opportunity Zone census tracts running through them. Apple and State Farm are currently among the largest employers with more than 1,000 employees in the Phoenix area, but the tech sector is growing. Intel alone is expected to add 3,000 jobs in Chandler, AZ. Phoenix is home to billionaire GoDaddy Founder, Bob Parsons, who is active in real estate in Phoenix as well. Many of the most promising Nashville Opportunity Zones surround the Cumberland River near Downtown Nashville. Opportunity Zones on both sides of the Cumberland River include emerging, trendy parts of town, such as East Bank, Edgefield, 12 South and Edgehill. 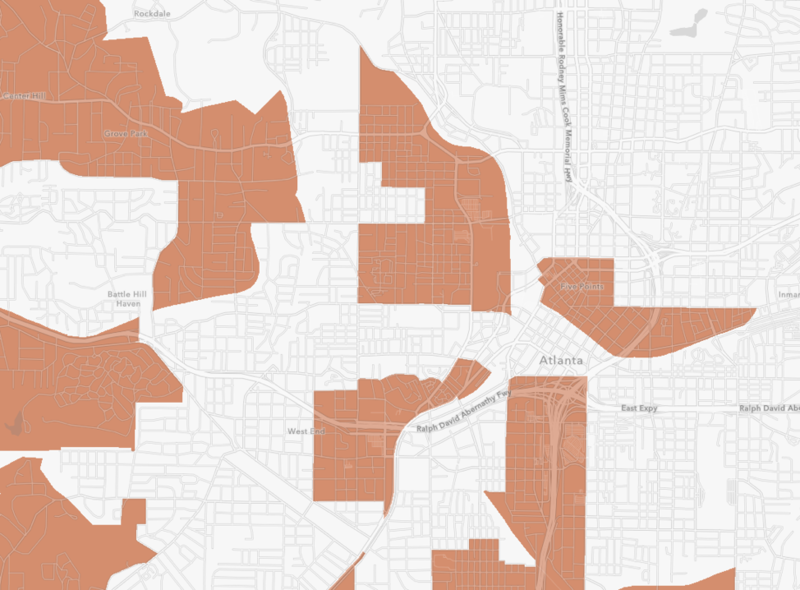 These neighborhoods are adjacent to neighborhoods that have experienced quite a bit of growth this cycle, such as Hillsboro Village, The Gulch / Pie Town, Germantown and Five Points. Nashville is currently experiencing tremendous business growth, which is also fueling demand for residential real estate. The multi-building Nashville Yards development is illustrative of the expansion underway Downtown. In total, it’s expected to add 4 million square feet of mixed-use real estate across 10 buildings. The tallest building, the tower, which adds 760,000 square feet, is slated to be finished in 2021. And, thanks to tax incentives for publicly traded companies enacted by the state of Tennessee, investment management firm, AllianceBernstein Holding LP, announced that it plans to move its headquarters of more than 1,000 employees from New York City to Nashville beginning in 2018. Several other development projects adding hundreds of thousands of square feet are also ongoing or under prospect. In addition to new office space, Nashville remains a key distribution hub for major companies such as Amazon, Under Armour and Macy’s. While residential real estate is being developed, the business boom is creating a housing shortage. The Nashville metro averaged a net gain of 94 people per day in 2017. With current and impending growth, new development and redevelopment can help prevent a severe housing crunch present in many other major cities. Atlanta was the third-fastest growing city in the country in 2017, adding roughly 90,000 people or 244 people per day in one year. Its growth is expected to continue with the development of both private and public real estate in the coming years. The first phase of the new 285-acre Bellwood Quarry Park not far from Atlanta Opportunity Zones is expected to open to the public in 2019. Occupying a prime location near the Bankhead MARTA station makes it even more accessible for residents. Zoning allows for up to 850 new residential units, a 300-room hotel and nearly 600,000 of office and retail space as walkable living spaces become more in demand. The new Interlock development in neighboring West Midtown is also expected to meet demand for more walkable residential and business spaces. The area is experiencing a transformation as the 9-acre former industrial site becomes a living and shopping center. Plans are taking shape for multiple boutique hotels, roughly 500,000 feet of office space, more than 100,000 square feet of retail space, 350 apartments and 70 single-family homes The office space is partly intended to support tech startups that grow out of the Georgia Advanced Technology Ventures, with the Georgia Institute of Technology just 1 mile away. With the addition of these commercial and residential real estate developments, neighboring Opportunity Zones will likely also experience growth. 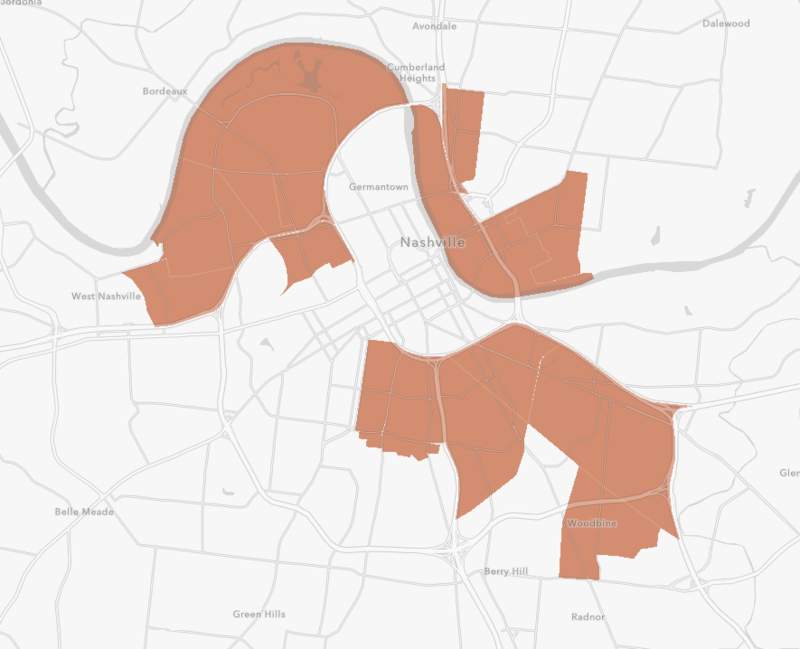 Opportunity Zones that fall in Grove Park, Center Hill, Carey Park, English Avenue, Knight Park, and Bankhead now offer opportunities to support spillover demand of the developments planned or underway over the next decade. There are many parts of the five boroughs of New York City that now fall into Opportunity Zones, but Brooklyn offers some unique opportunities for greater development. Many parts of Downtown Brooklyn, Brooklyn Heights, Clinton Hill, Williamsburg and the entire Brooklyn Navy Yard now falls into Opportunity Zones. The headquarters of Etsy now sits on the periphery of an Opportunity Zone and several startups also now sit in or near Brooklyn Opportunity Zones. Other tech and new media organizations, such as Kickstarter in Greenpoint and Vice Media in Williamsburg call Brooklyn home. More than 1 million square feet of commercial real estate is set to be added in Brooklyn within the next 3 years, and more housing is needed to address the housing affordability issue that the area faces, which will likely become increasingly acute with the addition of many new businesses. For example, the median sales price of a new condo in Brooklyn increased from approximately $700,000 in Q4 2012 to a peak of just under $1.6 million in Q1 2017. It’s currently trending just under $1.2 million due to new supply entering the market, according to MNS. Much of the residential development has been concentrated in the luxury rental market in north Brooklyn neighborhoods such as Dumbo, Downtown Brooklyn, and Williamsburg. Downtown Brooklyn represents 8% of all deliveries in the entire New York City metro area over the past 12 months. Its production ranks second only to the Long Island City submarket in Queens, and Williamsburg ranks number 4 according to a recent Co-Star report. Other nearby neighborhoods that are now included now in Opportunity Zones, such as Crown Heights, Bedford Stuyvesant, Lefferts Gardens, Sunset Park, and South Slope have already experienced some of the benefits of redevelopment and higher demand, along with some of the challenges of gentrification as they relate to affordability. There are still opportunities for investment in these neighborhoods at a more affordable basis than in Dumbo or Williamsburg. Per MNS, the average two-bedroom monthly rent in Crown Heights has increased 12% over the past 3 years, but the current average rent for a two-bedroom is approximately $2,500, which is affordable by New York standards. There are many Texas Opportunity Zones that offer promise for increased investment, but Houston offers some of the largest and most immediate opportunities for impact. Large contiguous sections of central parts of the city extending north and south of the 610 freeway now fall into Opportunity Zones. Unlike some of the other cities on this list, Houston hasn’t experienced a surge in development in recent years due to some setbacks such as Hurricane Harvey and gasoline shortages. However, the Opportunity Zone program can offer greater opportunities for investors to consider investing in area that were previously overlooked. New Opportunity Zones can encourage investment in development of new commercial and residential real estate, which could be a catalyst to diversify the city’s economy away from oil-centric employment. In the Gridiron neighborhood, NRG Stadium now falls into an Opportunity Zone. Just north of this area, some medical facilities, including the Woman’s Hospital of Texas also fall into an Opportunity Zone. Even more medical facilities comprising the 2.1-square-mile medical district of the Texas Medical Center and Rice University now sit adjacent to multiple Opportunity Zones to the south and east. Opportunity Zones now offer greater potential to develop real estate to support the more than 17,400 physicians and 6,800 Rice University students in the region. Greater development and redevelopment also create the potential to attract a greater number of students and professionals to the city diversifying its economy. Further north, roughly half of Midtown Houston and the entirety of Downtown Houston now fall into Opportunity Zones. These areas have attracted more technology-based startups in recent years, and the region is now home to more than 140 startups with venture fund funding totaling approximately $1.3 billion. Houston’s massive medical community has also found its way into technology with more than 1,760 life science and biotechnology companies now in Houston. Property values in these areas have risen significantly in recent years, which has created obstacles for further developments. However, Houston Opportunity Zones may encourage greater real estate and business developments in these areas broadening and strengthening the city’s economy. Of the more than 8,700 underserved census tracts that are part of the Opportunity Zone program, those based in or near growing neighborhoods of expanding cities are positioned to benefit, and likely immediately, from current growth trends of their cities. If you’re interested in learning how you can invest in Opportunity Zones and take advantage of the capital gains tax incentives available to investors, learn more about the Fundrise Opportunity Fund here. 1 Change in home prices over one year are changes in price at a city-wide level calculated between May 2017 and May 2018 according to Zillow. 2 Change in home prices over five year are changes in price at a city-wide level calculated between May 2013 and May 2018 according to Zillow. With broad capital gains tax advantages available immediately and over the long term, Opportunity Funds could offer enormous tax savings for cryptocurrency investors looking for the most advantageous ways to protect their large capital gains. Opportunity Zones were established under the Opportunity Zone program as a way to revitalize economically distressed communities using private investments. But, what are they exactly and how do they work? We explain the fundamentals of Opportunity Zones and how they can impact more than 8,700 census tracts across the US.